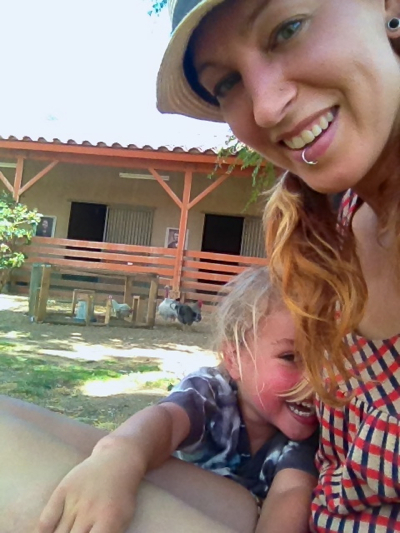 Our first visit to Animal Acres in Acton, California. A few weeks back I wrote a post about why vegan children don’t visit the zoo, and I offered up one of my favorite zoo alternatives: the Natural History Museum. That post sparked a lot of discussion, with so much insightful input and so many diverse points of view, and it made me incredibly grateful that there is such a special community of people that visit this space. So today I want to share some more of my thoughts around the ethics of keeping captive animals. Oh, and also to talk about another awesome place that vegan kiddos can go to learn about the amazing animal kingdom! Sanctuaries! Animal sanctuaries provide the same in-person, interactive experience that many folks really miss when they give up going to zoos. At sanctuaries, the animals are there, in your face, and often in your arms (if you’ll let them – they can be pretty cuddly!) The majority of sanctuaries in America are geared towards farm animals, because obviously, those are the ones that need the most rescuing here (over 10 billion individuals killed every year). But many sanctuaries also focus on smaller subsets of animals like exotic birds or reptiles, retired or liberated research primates, or large cats like lions and tigers (which are tragically sold as “pets” and then abandoned when they grow up to be too big and, you now, not actually domesticated). 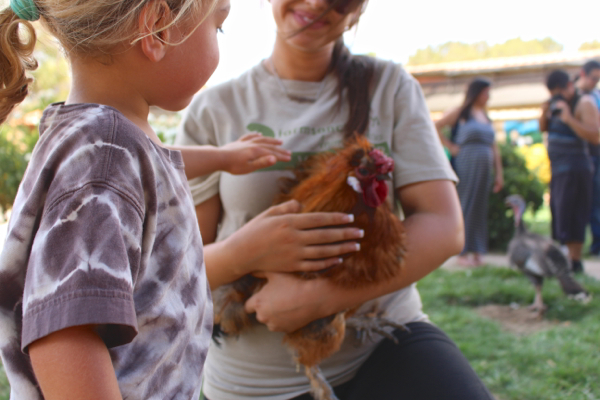 Sanctuaries give children the opportunity to connect with non-companion animals; to meet them, observe them, and often times even to touch them. But unlike traditional petting zoos which position animals as monetized commodities who exist to serve as tactile entertainment, sanctuaries do not exploit the animals in their care. When it all boils down, the difference is the bottom line. A traditional zoo or petting zoo is a for-profit institution, whereas sanctuaries are always non-profit organizations. To me, this distinction makes all the difference. Because in any for-profit setting, the money is, unfortunately, the primary motivating factor. Increasing revenue will always take precedence over the interests of the animals, because that is the way the system is designed to work. Conversely, in non-profit organizations, the welfare of the animals always comes first. Because that is the reason the organization exists! I think about it like this: a traditional zoo or petting zoo is a place that exists for human entertainment, and animals happen to live there. In contrast, a sanctuary is a place that exists for animals to enjoy their lives in safety, and humans happen to go there. In typically-gendered little boy fashion, it’s not ALL about the animals! 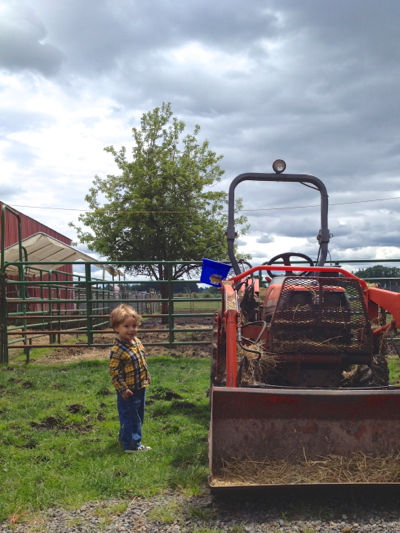 A very wee Waits stands in awe of a mighty tractor, on our first visit to Lighthouse Farm Sanctuary in rural Oregon. There is something deeply moving about visiting an animal sanctuary, and it’s something that in my experience, even the children can sense. Personally, I always find myself emotionally affected when I get to spend time with the lucky few who are saved. It’s a confusing mixture of joy – watching them revel in a dust bath or kick their legs at a good tummy rub, knowing that they will never have to hurt again – juxtaposed against the reality of the horrible, heartsickening conditions that their billions of brothers will have to endure. And sure, that’s an entirely adult response. Certainly the children don’t experience a sanctuary in such complex emotional terms, but I swear that they do get some sense of it, too. In the very best way, the children I witness at sanctuaries seem acutely clued into the preciousness of the place. The magic that’s created when people pledge to put the interests of animals first and foremost, always and forever. That magical feeling is sort of indescribable, so really, you should experience it for yourself. Hay fight! 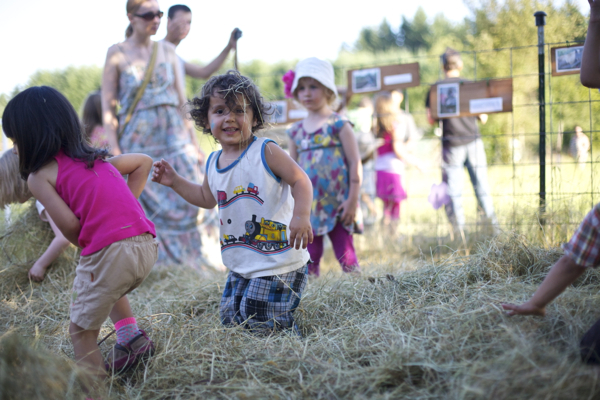 At the Out To Pasture Santuary’s annual summer “hoedown” in Estacada, Oregon. 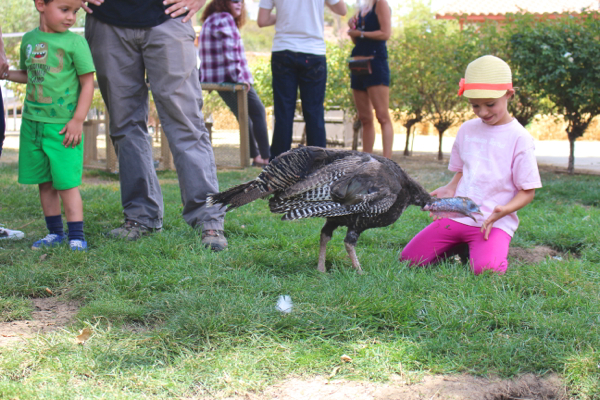 There are animal sanctuaries literally everywhere – and there’s probably one near you! These organizations operate on limited funds and thus, they don’t really get out there and advertise. But more likely than not, there’s a sanctuary within driving distance from where you live. You can check in with this list for a comprehensive guide to America’s farm animal sanctuaries, or you can try Googling “your city + sanctuary” or “your state + sanctuary” and see what you come up with. Awesome follow up! :-) Always love reading here. 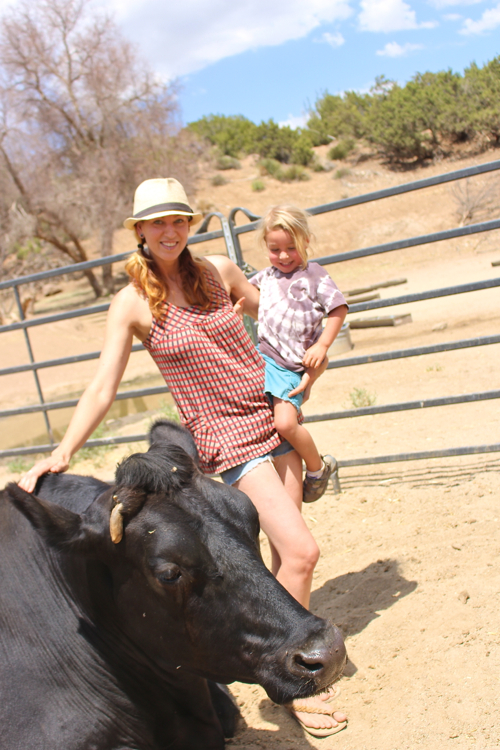 I recently moved to San Antonio & haven’t gotten around to looking up a local farm sanctuary–I would love to take my kids there. Thank you for the reminder–I want my kids to have the experience of being around animals, which just isn’t going to happen if I don’t go out & make it happen. Thanks for such a great explanation of the important differences between zoos and sanctuaries. Finding a sanctuary to visit near me is on my to-do list! Great points. I think the profit motive is an important one and it’s colored my thinking about various zoos (I just implicitly trust non-profit ones and distrust for-profit ones). And on a different note, my little girl LOVES tractors! Actually, most major zoos are non-profits, so I think that needs to be made clear. San Diego, Philadelphia, Audubon, Phoenix, Columbus, Indianapolis, Woodland Park, Houston, Cinncinnati, Fort Worth, Brookfield, Lowry Park and San Antonio Zoos for example are all not for profit institutions among many others. Also, PLEASE please please don’t lump small petting zoos into the same category. Very different things. I am also having a hard time with the statement that “a traditional zoo or petting zoo is a place that exists for human entertainment, and animals happen to live there”. This is merely your opinion and shouldn’t be stated as fact. Knowing such an institution as well as I do, I have to completely disagree with this. It’s just so far from the actual truth. That piece I promised you is finished- I am sorry it took so long. I am now just waiting on my other vegan zookeeper friend to return from out of town to edit it for me. One last note… in your last post on zoos you mentioned natural history museums as an alternative. But did you know that the Smithsonian Natural History Museum in DC is largely filled with animals that were killed by a trophy hunter? I just took my kids to a farm sanctuary in the area. It was a wonderful experience. I love our local zoo (Im in Australia) and most of the animals are in amazing, spacious (ok not open plains but we got one of those zoos too!) enclosures with most of the area hidden from view. But there are a few solo animals in older spaces that always look so distressed and sad that it breaks my heart. I tend to avoid those areas (as do other locals – an actually the zoo seems to have routed the paths away from them). I’m looking forward to the sound of your article. Beautiful post, awesome pictures! We love the animal sanctuary here (http://www.edgarsmission.org.au/ ) the passion and dedication of the people running it is inspiring. I also agree, it is really confronting when you stop and realise that these animals are in the minority, that normal for most farm animals is something incomprehensible. I wonder how we got here as a society. Thanks again for your generosity in posting of yourself. Thanks for this Sayward. I’ve taken my kids to the zoo twice, years ago before I was vegan and it left a bad taste in my mouth both times. I felt horrible. We’ve since become more aware of animal welfare and have become vegan. Now, my kids don’t really ask to go because they feel bad for the animals. Thanks for this awesome suggestion, I ‘ve looked up animal sanctuaries in our area. We also have a reptile rescue centre type of thing that the kids love. It’s still hard, I find, to be that parent, the one who won’t take her kids to the zoo. I’m sure you’ve heard, or perhaps you haven’t, but the LA city council just banned the use of bullhooks on elephants in the city. This will apply to any circuses that may come to town. I know circuses are often guilty of animal mistreatment, but this could be a step in the right direction.